A fast-moving wildfire ripped through rural neighborhoods near Viejas Casino amid a blistering heat wave Friday, leveling homes, blackening hundreds of acres, forcing evacuations and prompting Gov. Jerry Brown to declare a local state of emergency. The blaze, dubbed the West Fire, erupted for unknown reasons alongside eastbound Interstate 8 at West Willows Road in Alpine about 11:15 a.m., according to Cleveland National Forest officials. The wind-stoked flames soon reached a “critical” rate of spread, Cal Fire reported. 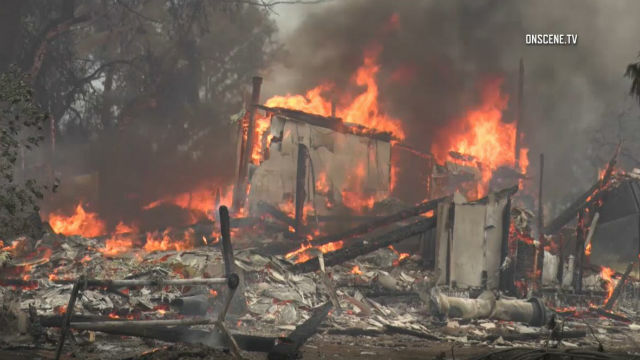 Live television news footage showed large tile-roofed homes and what appeared to be residential trailers and small outbuildings engulfed in fire. Dozens of structures appeared to have been gutted. Cal Fire officials, for their part, reported that “numerous” dwellings and other edifices had been lost. Crews from various local agencies attacked the blaze on the ground and aboard water- and retardant-dropping aircraft while braving midday heat measured by the National Weather Service at 108 degrees. Sheriff’s deputies urged residents of Alpine Oaks Estates and areas south of the intersection of Alpine Boulevard and South Grade Road to clear out of their homes immediately. As of about 7 p.m., an evacuation order was in effect for Tavern Road at Alpine Bouelvard east to Viejas Creek Trail, south to Japatul Road, west to Tavern Road, and for all secondary roads within that boundary. An evacuation warning was in effect for Alpine Heights Road and all secondary roads running off of Alpine Heights, according to Cal Fire. The American Red Cross set up an overnight evacuation site at Los Coches Creek Middle School on Dunbar Lane, and a temporary shelter was established in a parking lot at Viejas Casino. Lakeside Rodeo on Mapleview Street was providing room for livestock of residents in threatened neighborhoods. About 1:30 p.m., the California Highway Patrol blocked off two of the three lanes of eastbound I-8 in the area as crews worked to subdue the blaze. Authorities also closed various neighborhood streets in the area, including Alpine Boulevard between Tavern Road and West Willows Road; Arnold Way between Tavern Road and Alpine Boulevard; South Grade Road between Tavern Road and Alpine Boulevard; Tavern Road at Dehesa Road; and the Willow Road offramp from eastbound I-8, near the origin point of the blaze. By 4 p.m., firefighters had the roughly 400-acre burn area about 5 percent contained, and all lanes of the nearby freeway were open again. An hour later, crews had the spread of the flames halted. One crew member suffered minor burn injuries to his face while battling the blaze, and was expected to remain hospitalized overnight, Cal Fire reported. No other injuries were reported. At the height of the blaze, about 3,500 homes and businesses at and around the site of the wildfire were without power, according to San Diego Gas & Electric. Some of those addresses are served by a circuit that the utility decided to deactivate as a precaution, and the rest lost service due to fire- related equipment damage, SDG&E spokesman Wes Jones said. As of 6:30 p.m., repair crews had restored power to all but 190 of the affected customers. The gubernatorial decree clears the way for the state to provide immediate disaster assistance to the county, allows for expedited unemployment benefits for anyone who lost a job due to the blaze and waives fees for replacement of documents — including birth certificates, marriage licenses and vehicle titles — lost to the flames.